Since I share all my most recent pieces on my other social media pages, (links on the right here) I thought you might be interested in seeing the sort of things I used to do “back in the day”! I was very interested in drawing and painting from a young age, and studied art in my GCSEs and for A Level back home. One of my favourite artists when I was growing up was René Magritte, and this painting was inspired by his 1934 painting, ‘The Collective Invention’. 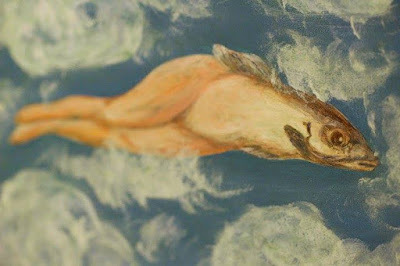 In the original, the reverse-mermaid is lying on a beach, but I wanted to add even more surrealism and had her in the clouds, like some strange hybrid flying-fish-mermaid. I used acrylics on cardboard, and I was very happy with the result! I have found over the years that when painting, I can be pretty good when I copy someone else's work, but struggle to come up with my own style. This is one of the many reasons I have not been painting in recent years, and now I am very out of practice, so I have absolutely no style at all! Reverse Mermaid by Original Sin Art, c. 1998. Acrylics on cardboard.